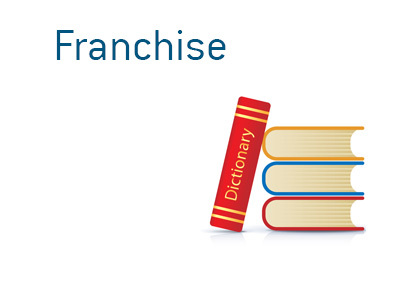 Franchise - What Does It Mean? What is a "franchise"? What is the definition of the term "franchise"? A "franchise" is the granting of a license to use a business' trademarks, brand and knowledge in exchange for money. For instance, a "franchisee" might have to pay an upfront fee plus a percentage of revenues in order to obtain a franchise. Examples of well-known franchises include McDonald's, Burger King and Subway, just to name a few. Under traditional franchise agreements, the franchisee will pay an initial license fee and front the costs to build the restaurant or business to the specifications of the franchisor. Once the business opens, the franchisee usually agrees to send a percentage of their revenues (usually between 2-6%) to the franchisor on an ongoing basis. In many cases, the franchisor will own the land that the restaurant or business sits on. The downside to opening a franchised location are the heavy start-up costs involved - in many cases, the franchisee will be required to put up an initial investment of over a million dollars. The upside, of course, is that they will be operating a brand that has already been established. For instance, a franchisee opening a new McDonald's location will have no trouble getting people through the door, due to the fact that everybody is already familiar with the McDonald's brand.